Brokers, investors and other users of the stock market have already started using the latest technologies in their day-to-day practice. With nearly 59,3% of the industry revenue, online trading has become more popular than ever. With that in mind and if we consider the fact that the majority of e-traders today are Millennials, we can only expect to see this trend continue to rise. Aside from that, we can see a significant increase in mobile traders which is why the world of online trading is bound to experience some significant changes. Therefore, it’s no wonder that cutting-edge trading software will continue to rise and develop even further, opening doors to new possibilities, strategies and lucrative opportunities. Here, we’ll explore some of the latest innovations in the realm of web and mobile trading platforms. Since trading is basically just a numbers game it’s no wonder that people have found a way to develop customizable charting tools. Charts are a very important aspect of online trading – especially if they represent growth – so it’s no wonder that such a major improvement has been made in this field. Nowadays, you can find numerous customizable charting tools that allow you to take quick shots of your account information, real-time market analysis, ability to export charts and graphs and much, much more. What’s more, even the mobile devices nowadays have the processing power necessary for delivering the fast, high-resolution graphics required by such a software which is excellent news for all on-the-go traders out there. Finally, the days of one-size-fits-all solutions are long gone. We – the users – are no longer presented with this approach which is more than great. Thanks to the latest technological advancements, we are now able to completely customize our platform layout to serve out personal needs, drag and drop workspaces, select data-providers much more easily and many other things that are bound to improve our user experience. With developers working non-stop on making all of this possible and user-friendly, numerous customization options will soon be no more than a simple few clicks away. Furthermore, research tools have also experienced significant growth. That’s why, lately, we can see numerous research tools that use the big data to present you with all the information you might be looking for, that will help you make the right trading decision. For instance, you can now find tools that combine all the latest market trends, news stories, various online trading reviews and social media feeds in order to present you with a clear overall picture you can base your decisions off of. What’s more, platforms that include big data analysis into their offer are becoming the norm which is definitely something to look forward to. Speed is definitely one of the most prominent benefits of e-trading. With the latest technology, online trading companies will be able to offer their users low-latency trading. This is definitely great news as latency issues can significantly affect the outcome of the trade by affecting data feeds and presentation as well as the order execution. So, look forward to completing the trades with no time and money lost as we all know that in the trading world time is money. Finally, while desktop traders still make a big part of all e-traders, mobile traders are taking over the scene. 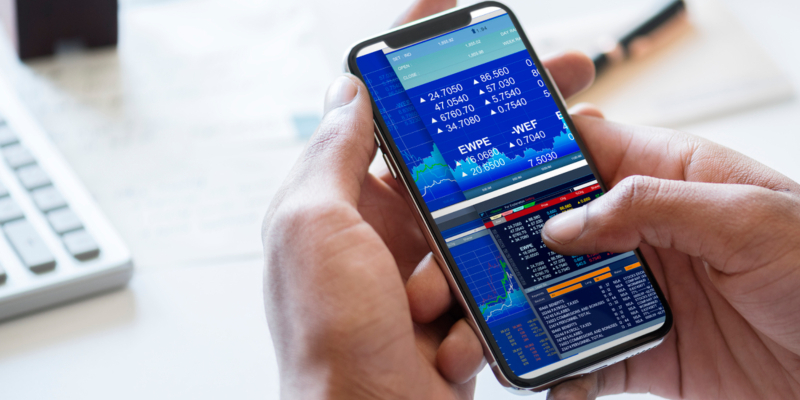 As virtually everything has gone mobile these days, it’s no wonder that the world of online trading wants to follow suit. That’s why online trading platforms need to make sure that they are not only fast, safe, secure and entirely customizable but mobile as well. What this means is that developers will need to find a way to not only adjust the layout to various mobile devices, but they will also need to replicate all the customization options and other preferences of their target users. This, of course, can only be achieved through cloud-based technologies. These were just some of the latest trends we can expect to see in the world of e-trading. While the desktop traders certainly have a lot to look forward to, mobile traders can expect the implementation of some groundbreaking innovations that will make their trading efforts as seamless as possible. To be fair, in such a technology-driven world we’re living in today, innovations such as these were almost long overdue.